William L. Johnson, the Ruben and Donna Mettler Professor of Materials Science at Caltech, joined the Caltech faculty in 1977. He received his B.A. in physics from Hamilton College and his Ph.D. in applied physics from Caltech. He spent two years at IBM's Thomas J. Watson Research Center (1975-77) prior to joining the faculty at Caltech. 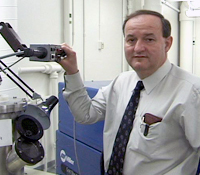 Professor Johnson's research interests are centered on non-equilibrium thermodynamic systems. His research advisor was Pol Duwez, the inventor of metallic glass. In the mid-1980's, he, along with Ricardo Schwarz, discovered solid-state amorphization, leading to many years of fruitful research. His research accomplishments include the first studies of superconductivity in metallic glasses, pioneering studies of crystal to glass transformations (see Progress in Materials Science, 30, 81-134 (1986)) and seminal work on the application of thermodynamics to ion beam induced modifications of materials (Nucl. Instr. & Methods, B7, 657 (1985)). This work was followed by the synthesis of nanocrystalline and amorphous materials by high energy ball milling, and, in 1993, the discovery of bulk metallic glasses. Professor Johnson has pioneered the discovery, characterization and science of bulk metallic glass forming alloys and their use as engineering materials (see, for example, Applied Phys. Letters, 63, 2342 (1993)). His recent work has involved the development of a theory that establishes fundamental physical principles governing flow in amorphous materials. His research group is continuing to discover new bulk metallic glass forming alloys employing both experimental methods and molecular dynamic simulations to predict potential glass-forming candidates. The discovery of new glass-forming alloys cascades into a chain of scientific investigations, including the measurement of thermal, mechanical, optical, electrical and viscous properties; fundamental research into the kinetics of crystallization and glass formation, and improving the properties of monolithic bulk metallic glass through the fabricaiton of intrinsically and extrinsically toughened composites. His research has lead to commercial success, too. He is an inventor on over 25 issued patents. 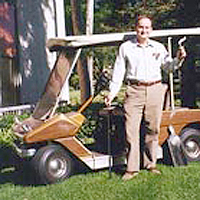 He is a cofounder of Liquidmetal Technologies, in Lake Forrest California, which commercialized one of Professor Johnson's BMG alloys for golf club heads (under the company name "LiquidMetal Golf"). The company is now pursuing opportunities in cases for electronic devices. They are also expanding into the defense industry, as some of the BMG composites have demonstrated properties superior to depleted uranium as high-velocity penetrators. Professor Johnson served on the editorial board of the Journal of Rapid Solidification, and serves currently as an associate editor for Journal of Applied Physics, and Applied Physics Letters. He is a principal editor of the MRS Journal of Material Science. He is author or co-author of over 230 publications in the scientific literature, and has contributed chapters to seven books. He has held numerous consulting positions for the Department of Energy, NASA, and corporations. Over the past two decades, he has been a consultant and on numerous advisory panels for the U.S. Department of Energy, NASA, the National Science Foundation, and the National Academy of Engineering. 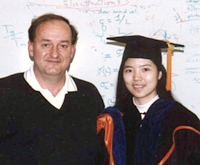 Professor Johnson has mentored over 65 PH.D. students over the past 30 years at Caltech. Many of his former students are faculty members at major research universities, while others are actively involved in industrial and government research labs.